All those who’ve been following me on Instagram already know about the latest addition to my fitness routine – a health band! And by now you also know that it’s not just any health band; it’s the one which gives me my basic information like calories burnt, steps taken, sleep hours clocked in, but goes a step further to tell me if the air I’m working out in is fit to exercise in! All those who watched me LIVE on Instagram know what I’m talking about. For those who missed it, here’s a sneak peak. And for those who are new to this, folks, say hello to FitMe, the new health band from iVOOMi. Before I start, I want to focus on WHY you must get yourself a health band in the first place. It’s important to keep a track of your health and fitness routines because not only does that show you your progress, but also helps you stay motivated. By keeping a record of your wellness journey, you can slowly start understanding how your body reacts to certain foods and exercises, and even things that affect your emotional state! I personally carry a food diary with me while traveling because I end up cheating way too often if I don’t track my food intake on vacation (I want to eat fries, pizzas, biryani, ice cream, smoothies, burgers, oatmeal, everything!) Keeping a diary helped me realise that not only do I stay on track with my diet, but also end up coming back home with a ton of good results (Yup, I always come back looking fitter thanks to the food trackers and excessive enthu shown while working out in a new place hahaha) So all that I’m trying to say is, a health tracker will help you track progress, and make you understand your own body. We might underestimate a health band, but at the end of the day it is the true fitness buddy with you at all times. 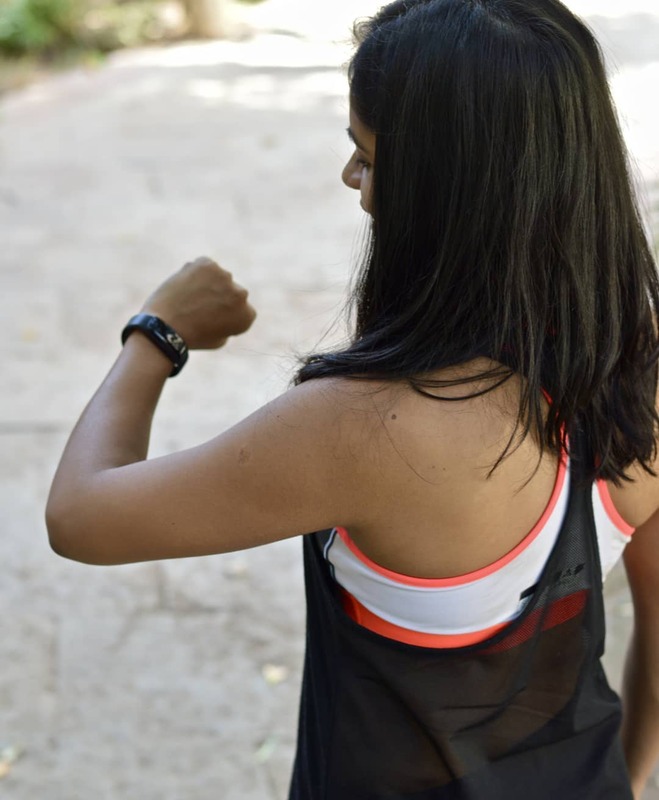 Now let me introduce you to FitMe, the new health band that I have been talking about on my posts and stories. To keep it simple, I’m going to note down the features here. You can always shoot me your specific questions on my email id dumbbellsanddrama@gmail.com or follow @iVoomi_india and write in to them. What makes the FitMe special? I can tell if the air I am working out in is fit for me. “What?! How is that possible?” This is precisely my reaction when I first heard of the AQI feature in FitMe. But it is true! I’ve now got used to checking my band before I start working out at the gym, or even when I step out for a run :D FitMe is the only fitness band that gives you information about the air quality or pollution tracking around you (this is called the air quality index- the AQI). What this essentially means is that it tells you the pollution levels of the air you’re in. It comes with an OLED Screen. It gives you a report of your heart health every 15 minutes. Every 15 minutes, this health band draws up a cardiogram that gives you a record of your heart health. 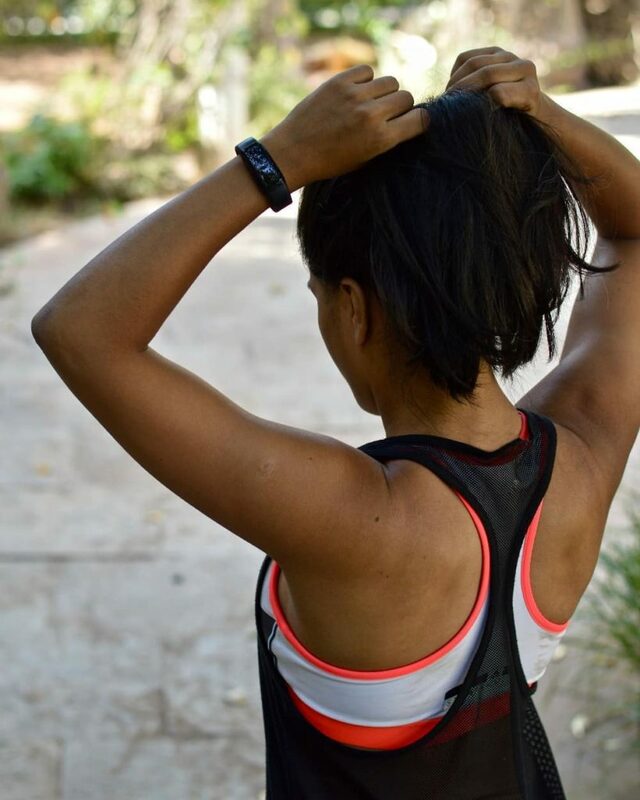 The Heart Rate Monitor draws a chart of your heart activity, which is great when you’re training because you know the limits to push your body to, plus you know when you need to cool down and warm up again. It is super convenient to charge this because it does not require extra wires and cables; all you need to do is plug it into your laptop to get it charging! This also comes in a very sleek design, with a strap that can be secured with a button (for clumsy peeps like me, this means a lot. I have lost count of the number of bands I have broken or lost because of you know, being clumsy.) This one stays secure, I have one month’s worth of proof for this. You can receive notifications and alerts for texts, calls, and even social media updates, you can set your personal goals and edit them as per your liking, you can track your sleep quality, steps and calories burnt, you can set alarms, and even use this in water for up to 30minutes. Where can you buy the FitMe band?